Over the years Sherlock Holmes has become one of the most iconic characters in film and television, and the inspiration for many of the detectives we’ve come to love in popular culture. It was inevitable that at some point in entertainment evolution, we’d end up with two. Yes, we’re talking the BBC’s Sherlock and the CBS show Elementary. More importantly, we’re asking, which one’s best? Most critics agree that Sherlock is the closest contemporary adaptation of Sir Arthur Conan Doyle’s stories, but does that mean that Sherlock is actually the best contemporary adaptation of those works? Let’s start with sciunz (Ed – Say what? ); the basis for all proper television rumination. In very loosely biological terms, adaptation is the evolutionary process of an organism, which will help it become better able to live in its habitat. So the world is always changing and to survive you need to evolve with it. So if you think of Elementary like that, you will know that this is the show that best adapted the Sherlock Holmes stories to the world of today without losing any of its big qualities; like his quintessential Britishness and powers of deduction. Firstly, Gender-swapping. In Elementary two of the main characters adapted from the stories have been swapped from male to female. One is the beloved John H. Watson, which in Sherlock is played by the fantastic Martin Freeman. But in Elementary we have Joan Watson, portrayed by the extraordinary Lucy Liu. The second one is Holmes nemesis Moriarty, who, in Sherlock, is portrayed by Andrew Scott (creeps the hell out of me, not in a good way), and in Elementary by Natalie Dormer. A lot has changed from the late 19th century when the stories were first published to now, and a big one is that women today aren’t oppressed housewives that can’t make decisions on their own. On the contrary, we’re here working alongside or in superior positions than men (the shock!) and very outspoken about equal rights, so it’s only fair that the creator of Elementary, Robert Doherty, thought that in this new world our beloved detective will be in much better hands in the company of a woman. And no, he doesn’t go all romantic-affair- type of relationship with Watson and Holmes, but instead gives Lucy Liu the chance to portray Watson as Holmes’ equal, something that is very different in Sherlock. In Sherlock, Watson is literally there as Holmes’ sidekick, and worse still, and they make Irene Adler, the only woman that could outwit Holmes, overly sexualised, there to fulfill the role of a love interest and just a pawn of Moriarty. Conversely, in Elementary, Irene is an extraordinary amount of wit, and is the only one to ever outsmart Holmes, mostly because she was too smart and very close to Holmes’ past, which also makes her know too much about him, making it harder for Holmes to outwit her. As if that wasn’t enough, they not only make Adler to be Jamie Moriarty but the only person to really outsmart her was our beloved Joan Watson. Woman v Woman. Watson v Moriarty. Elementary was here to break audience expectations, by letting Watson to be the one to bring down Moriarty. It also has people of colour. Diversity! If you’re adapting a show to 21st century London, like Sherlock is, then you better check if maybe the London of today is more diverse than the London of the 19th century. And guess what? It bloody is. According to the 2011 census, only 60% of people in London are white, so why the hell is everyone in Sherlock white? Elementary doesn’t make the same mistake; they know that roughly 44% of the people of New York are white so they knew they had to bring some diversity into the show. So not only is Watson a woman, but she is also a WOC. We also have NYPD detective Marcus Bell (Jon Michael Hill), Alfredo that is Holmes’ sponsor (Ato Essandoh), and as that diversity wasn’t enough, we get Ms Hudson, who in Elementary is a trans-women and one of Holmes many experts. They also make sure to show that diversity in their daily cases and day-to- day life. Talk about getting some diversity in, right? Last but not least, one big reason is also in the name of each show. 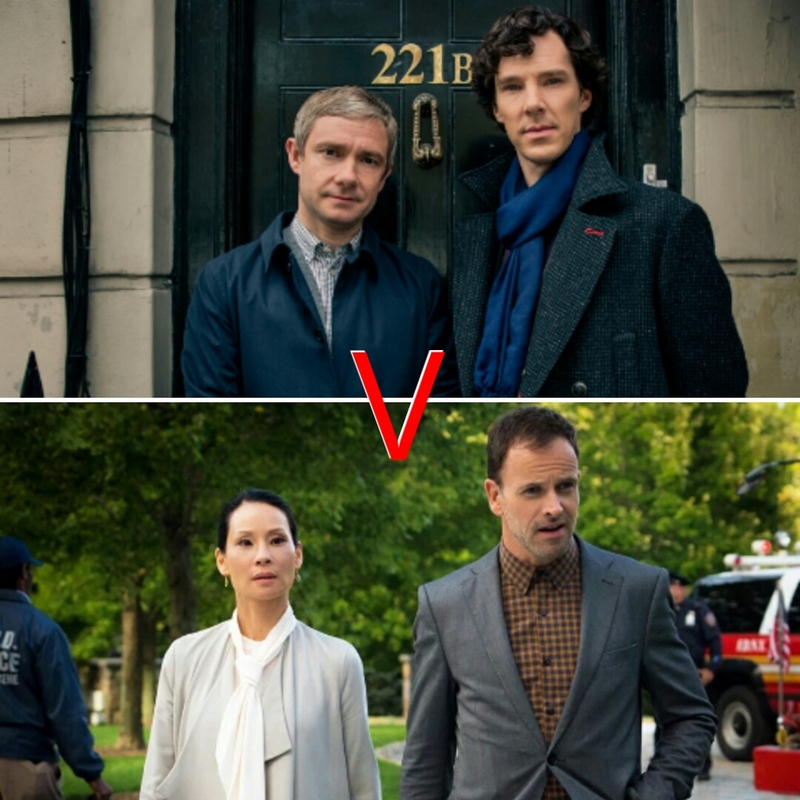 One’s called Sherlock, where all the characters are there to serve and help Holmes’ already brilliant mind, whilst the other is called Elementary, which is all about the detecting, where all characters have their struggles, all are intelligent, interesting and you feel like you can relate to them. Holmes also has his own struggles and failures, making him more human and more relatable without diminishing his brilliance. Elementary was created to not only bring our beloved detective to life, but also to re-imagine Sherlock Holmes in today’s world, with strong women, diversity and equality. Sherlock was created to show us every 2 years how brilliant Benedict Cumberbatch is as Sherlock (when he’s not too busy being a mega film star!) and if the 21st century was still exactly as it was when Sir Arthur first created the character. In the end, both shows are must-see, and the real winners here are us. All of us, because Sherlock Holmes fans get to enjoy seeing the beloved character once again portrayed on screen. Now, if you ask me to choose which of the actors, Benedict Cumberbatch or Jonny Lee Miller is the best at portraying Holmes, well that I can’t do, as they both bring very different but equally brilliant performances to the screen. I will say, though, that while Elementary is the best contemporary adaptation, as it has been sure to evolve and adapt to the world its portrayed in, the closest contemporary adaptation to the Sir Arthur Conan Doyle stories of our beloved detective, is Sherlock. But y’know. As we like to say here at LWT. Why not have your cake and eat it too. Sherlock is available on BBC iPlayer. Elementary shows on CBS in America. Some time ago I did some writing for this awesome little TV blog called Let’s Watch Telly. This was my first writing piece for them, about Sherlock v Elementary and which one it’s the best contemporary adaption of Sir Arthur Conan Doyle stories. Go give it a little read.